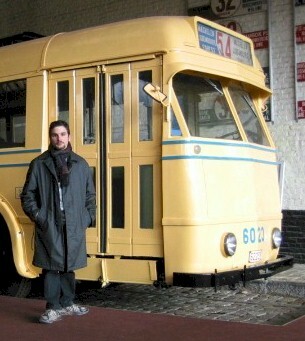 Why a website over the Brussels' Trolleybus ? Why a website over the Brussels Trolleybus ? In Brussels, this kind of vehicle had a short existence and never found a definitive place in the city : into service in 1939, this concept was used for the service of a difficult line where other types of vehicles weren't really profitable in this time. But it was true, and especially after the Second World War, that the mechanical evolution of the trams and buses corresponded to the end of the trolleybus in Brussels (and in many other places), the wear and the service costs of this system were further arguments that brought the STIB/MIVB to withdraw the trolleybus service in february 1964, when numerous tram lines were converted in bus lines. The trolleybus is actually only a memory in the capital of Europe. This 25 years of service have let some traces, if not in the city, in the memories. This vehicle is still present in the memory of all the persons who travelled once or more than one time with these vehicles. The urbanisation massacre will never cancel these memories. It's the same for me, even if I never knew the trolleybus service in Brussels. If you don't have done it yet, please visit this website over a particular vehicle, that rode on a line, which the webmaster of this site is actually an everyday client. Don't be afraid, it's me ! I'm born in Etterbeek exactly 53 days before the opening of the underground service in Brussels. I have interest into public transports for a very long time (Because we don't have a car in the family, I was naturally interested in my childhood into the public transports and the bicycle). The 4 years old young boy in this time was really passionated about the lines with red numbers next of his house (the red numbers in Brussels were the indication that the line went outside Brussels and so had a special tarification), and in the centre of Forest we were particularly good deserved with this kind of lines (line 50 : Bruxelles-Midi - Lot, line 54 (already in the list ! Was it a sign ? ), and line 58 (Vilvoorde - Danco)), after that, my brother brought my interest to the rest of the net. My interest never became weaker with the time... I was already an acute specialist at 6 years old. After that I begin to have interest to the past of the Brussels' net and could develop with the years (don't worry, I was much older than 6 years old at this moment) a great knowledge over the evolution of the Brussels' net. Why do I have interest into the vehicle behind me ? It got me surprised and fascinated since the first time I saw it ("oh, that's a bus like a tram!"). I wondered in this time how it was possible. Since this period I stay a longer time next this vehicle everytime I see it. That it rode on line 54 next of my door had a very poor influence on my attraction, but it could be possible that it helped me to have it (yes, absolutely, I must admit it).